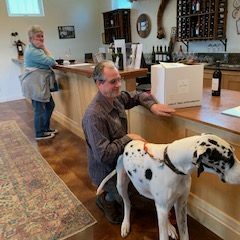 Riley, the official greeter at Barr Estate Winery in Paso Robles, had a visitor/wine taster bend down to meet her and she promptly turned around and sat on his lap. Just the best ambassador of the breed! Thanks to Tealy Barr for sending us this photo. If you are in the wine tasting mood, don’t forget to visit Barr Estate Winery and meet Riley. I recommend their Dane Head Wine (great for gift giving to your fellow Dane enthusiasts).